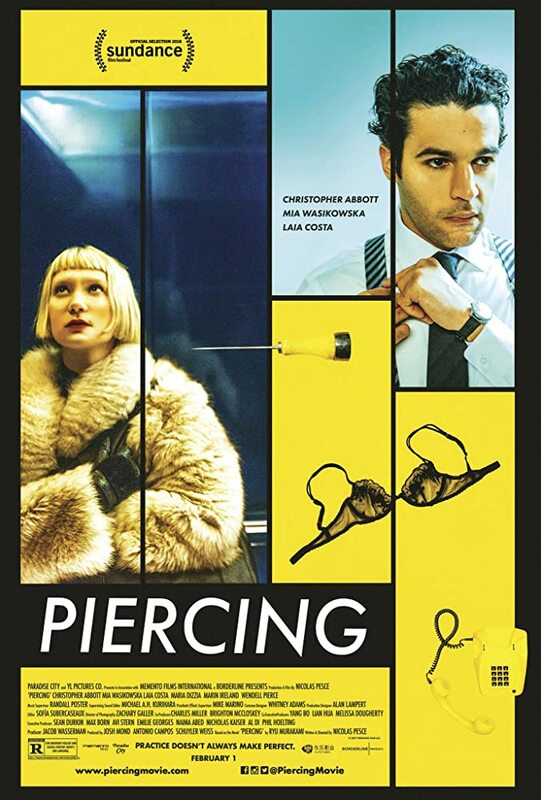 Synopsis: Reed (Christopher Abbott) is going on a business trip. He kisses his wife and infant son goodbye, but in lieu of a suitcase filled with clothes, he's packed a toothbrush and a murder kit. Everything is meticulously planned: check into a hotel and kill an unsuspecting victim. Only then will he rid himself of his devious impulses and continue to be a good husband and father. But Reed gets more than he bargained for with Jackie (Mia Wasikowska), an alluring call girl who arrives at his room. First, they relax and get in the mood, but when there’s an unexpected disruption, the balance of control begins to sway back and forth between the two. Is he seeing things? Who's playing whom? Before the night is over, a feverish nightmare will unfold, and Reed and Jackie will seal their bond in blood. Based on the critically acclaimed cult novel by Ryu Murakami (Audition), Director Nicolas Pesce (The Eyes of My Mother, Sundance 2016) blends psychological horror with comedy and stylish neo-noir, resulting in a sly take on the fantasy of escape and the hazards of modern romance. Universal Pictures will release the film in theaters, On Demand, and Digital on February 1st.